The standard that organizations must meet to qualify as tax-exempt in Pennsylvania is defined in the Institutions of Purely Public Charities Act, signed in Nov. 1997. The act generally follows the criteria set in 1985 by the state Supreme Court, which outlined the requirements of a purely public charity. Like the court ruling, the law says that a purely public charity must meet a five-prong test. (5) operate entirely free from private profit motive. What I have noticed is that there has been little inquiry by the public into how the important principles of accountability, conflict-of-interest, executive compensation, fiscal custodianship, and fair wages and benefits have been applied by arts and entertainment organizations that also receive tax subsidies in addition to being tax exempt. It is the mission of the Allegheny Regional Asset District (RAD) to support and finance “regional assets”, such as libraries, parks and recreational areas, cultural institutions, and sports and civic facilities and programs. The RAD’s source of funding is a dedicated stream of one-half of the proceeds from the 1% Allegheny County Sales and Use Tax. The majority of these funds are spent as what are known as “Funding Category A” disbursements, which are essentially operating expenses in support for ongoing activities of the organization and is typically unrestricted. There is undoubtedly a benefit in using Allegheny Regional Asset District (RAD) money and other forms of tax revenue to fund arts and entertainment in the region, as these dedicated sources help insulate those entities from an uncertain economy. However, there is also a dark side to the dependency created by this arrangement. An atmosphere of “entitlement” is created among cultural institutions, which have come to expect annual increases in funding year after year, and tax money begins to approximate a “bailout”. For example, the Urban Redevelopment Authority recently authorized a 2 million dollar loan to the August Wilson Center, which, in all likelihood, will never be paid back because of the inability of obtaining sufficient financing for the 42 million dollar facility. I would venture to say the general public has only the faintest understanding of the inner workings of the alphabet soup that comprises the Regional Asset District (RAD), Urban Redevelopment Authority (URA), Redevelopment Authority of Allegheny County (RAAC), Sports and Exhibition Authority (SEA), Stadium Authority (SA), Pennsylvania Department of Community and Economic Development (DCED), and the Redevelopment Assistance Capital Projects (RACP). The public remains largely unaware of how its own money is used by these entities. This is especially disconcerting when one realizes that many of the very (Exhibit 6) same politicians and their appointees, including but not limited to the mayor’s office who authorize distributions to these entities, are actually sitting on their boards of directors – a conflict of interest that could not be more stark! Pittsburgh City Council President, Darlene Harris. The distribution is made by a Board of Directors composed of four persons appointed by the County Chief Executive, two appointed by the Mayor of Pittsburgh and one person elected by the six appointees. The six appointees serve terms concurrent with the appointing authority while the seventh member serves for two years. Sala Udin also ex officio member of the August Wilson Center Board. Daniel Lavelle, Pittsburgh City council member. And maybe that’s the problem. Pittsburgh’s cultural community is a “closed shop”. From what I can see, not one major arts organization in Pittsburgh has had a representative from labor to serve on a board. One giant inequity is evident in the practice of appointing those to boards who are beholden to them, seeing that even supposedly independent board directors have subtle connections. 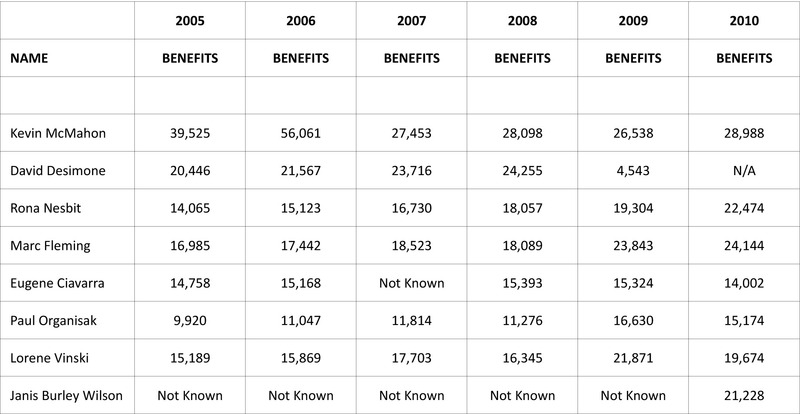 Increases in pay to non-profit arts organizations CEO’s over the last ten years have skyrocketed. The non-profit tax exempt real estate development arts organization, the Pittsburgh Cultural Trust, with 87 million in unrestricted assets and a 123 million in net assets President, Kevin McMahon’s salary has nearly tripled. The management staffs of Pittsburgh’s arts organizations have expanded substantially in recent years. The Cultural Trust now employs 3 ½ times the full-time salaried employees it did 25 years ago with 100 now compared with 28 employees in 1987. Many of these positions encompass duplicity of work and wasteful business practices even with the layoffs of 11 staff including one Vice President in 2009. Most of that cost savings went to additional compensation to other senior staff members. Yet when Stagehands asked to be included for such events as First Night and the Three Rivers Arts Festival, McMahon fretted in print these events would be prohibitively expensive under a union contract; however, consideration would be given in exchange for relief inside the theater. Oddly, the Trust operates the largest theater between New York City and Chicago, the Benedum Center, ranking 4th in the world for ticket sales and having a 50 year lease with the SEA for one dollar a year. The Benedum Center receives $850,000 from RAD a year, and has never operated in the red. The granting of our tax dollars is not isolated to non profits. The Pittsburgh Steelers organization with a net worth of 1.01 billion partnered with Columbus, Ohio, based Promowest Productions and received $2.5 million from RCAP as the sub-grantee from the Stadium Authority for the construction of Stage AE on a parcel of land between the two stadiums–on the North shore called the option area–in a deal between the SEA and Stadium Authority. There is virtually no accountability pertaining to the disbursement of RAD, RCAP and other tax dollar sources other than submitting application. Any reasonable person I believe would concur with the conclusion that receiving public money necessitates accountability. I am waiting for the day our cash strapped city and county ensures accountability. Stage AE is a for profit facility owned by the Pittsburgh Steelers and Columbus, Ohio Promowest and received our tax dollars though an authority. An out-of-state company received Pennsylvania tax payer money. 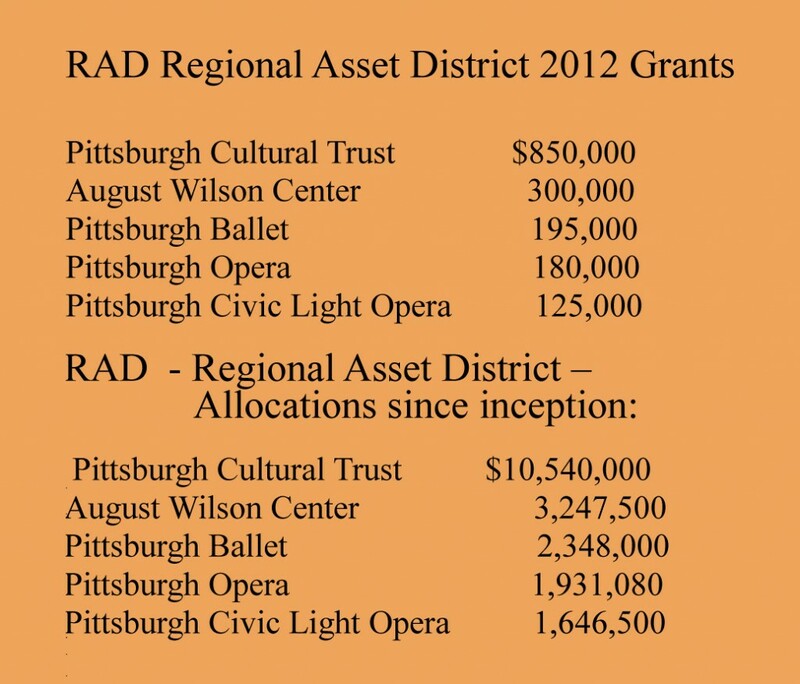 The Pittsburgh Opera, Pittsburgh Ballet, and Pittsburgh Civic Light Opera have all hemorrhaged funds in service of the purchase of new buildings within the last three years while at the same time pointing to these supposedly desperate economic times. The Cultural Trust, Pittsburgh Opera, and Pittsburgh Ballet all receive funds.